In June, when the US Immigration and Customs Enforcement agency (ICE) began separating migrant children from their parents, several tech companies came under fire for providing the agency with the software that helped them do it. At the center of the criticism was data mining company Palantir, which designed the Investigative Case Management system. The ICM is a critical component of ICE’s deportation operations—it integrates a vast ecosystem of public and private data to track down immigrants and, in many cases, deport them. Little is known about how the software actually works or how extensively ICE uses it. But within the first nine months of the Trump administration, ICE arrests increased 42% compared with the same period in the previous year. According to civil rights and immigration activists, ICM is fueling the mass surveillance and targeting of immigrants at an unprecedented scale. Now a new investigation, published today, sheds more light on the web of tech companies involved in supporting ICE and its parent agency, the Department of Homeland Security. The report, commissioned by activist organizations Mijente, the National Immigration Project, and the Immigrant Defense Project, found that Amazon has played as central a role as Palantir in providing the backbone infrastructure for many of ICE’s, and DHS’s, key programs. Amazon has also enjoyed a cozy relationship with the federal government that has helped it secure an outsize number of government contracts. “What we’re starting to see more and more is that technology and technology contracts form a huge part of ICE’s budget and are also one of their critical tools for how they’re conducting enforcement on the ground,” says Jacinta Gonzalez, the field director at Mijente. In 2017, an Intercept investigation found that ICM pulled together data from an array of federal and private law enforcement entities to create detailed profiles that were then used to track immigrants. That data could include a person’s immigration history, family relationships, personal connections, addresses, phone records, biometric traits, and other information. All of that data and the algorithms powering ICM are now being migrated to Amazon Web Services (AWS) in their entirety; Palantir pays Amazon approximately $600,000 a month for the use of its servers, according to the report’s authors. Though the money doesn’t flow directly from ICE to Amazon, the tech giant had the right incentives in place for Palantir to choose AWS. In order for Palantir to secure its contract with the government, ICM had to be hosted on a federally authorized cloud service. An online government database shows that Amazon holds the largest share, 22%, of federal authorizations under the FedRAMP program, which verifies that cloud providers have the necessary security requirements to process, store, and transmit government data. More important, Amazon holds 62% of the highest-level authorizations, usually needed to handle data for law enforcement systems. In a sense, Amazon was merely capitalizing on a trend. In 2010, the US government established a “cloud first” policy and began moving its agencies’ data and computing resources to the cloud. That was cemented in 2014 with the passage of the Federal Information Technology Acquisition Reform Act (FITARA). As the legislation was moving through Congress in January of that year, Amazon, Microsoft, and EMC (since acquired by Dell) formed a lobbying group called the Cloud Computing Caucus Advisory Group to help push it through. The three companies’ PACs also contributed over $250,000 in direct campaign contributions to the two members of Congress sponsoring the act, the Mijente report found. Additionally, DHS was among the earliest agencies to adopt Amazon cloud services under Mark Schwartz, chief information officer at the US Citizenship and Immigration Service (USCIS). In 2017, after facilitating a major migration of one of DHS’s sub-agencies to AWS, Schwartz left the agency to become the enterprise strategist at that company. AWS did not respond to MIT Technology Review’s request to speak with Schwartz about his relationship with the company during his time in government. In addition to powering ICM, AWS hosts several of DHS’s other major immigration-related databases and operations, including all the core data systems for USCIS and biometric data for 230 million individuals, including fingerprints, face records, and iris scans, which are playing a growing role in immigration enforcement around the country. 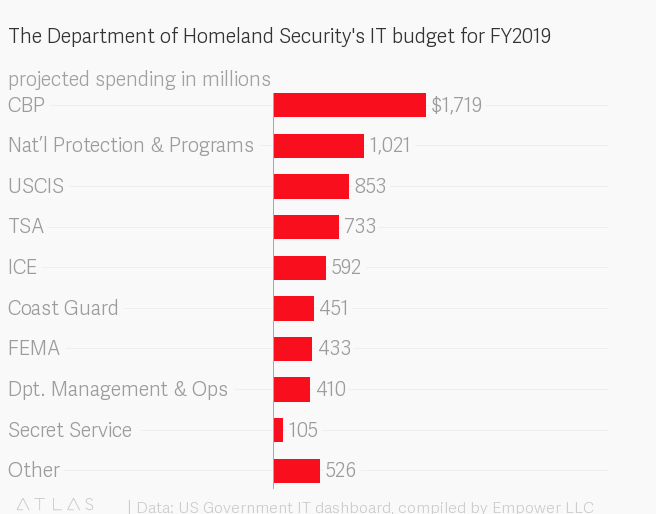 There is no publicly available data on how much Amazon profits from these contracts, but DHS’s complete IT portfolio totals $6.8 billion, which accounts for close to 10% of the agency’s projected spending in fiscal year 2019. An AWS spokesperson had no comment when presented with details of the new report. Amazon is now also bidding for a $10 billion contract with the Department of Defense to modernize the agency’s computing infrastructure and integrate all US military operations into a single platform. Because of the company’s existing dominance among the government’s cloud providers, it is widely expected to win the contract. The new investigation comes amid rising pressures on Amazon and other big tech companies to adhere to higher ethical standards in developing and deploying their technologies. Just last week, an anonymous Amazon employee wrote an open letter to the company demanding that it stop selling its facial-recognition platform Rekognition to law enforcement officials. Despite this, the Daily Beast reported today that Amazon employees were trying to sell Rekognition to ICE as recently as this past June. The letter’s author also referenced an internal letter signed by over 450 employees demanding that Amazon discontinue its contracts with Palantir. Google and Microsoft employees have similarly protested their employers’ controversial dealings with the government. After intense internal objections, Google withdrew its bid for the $10 billion DoD contract earlier this month. Days later, Microsoft employees posted an open letter asking their employer to do the same. Bezos also remarked that society’s “immune response” would kick in to prevent Amazon’s technology from being used in harmful ways. The statement received heavy criticism from civil rights activists and Amazon employees alike. For the moment, there’s no sign of that changing.